One of our own recently returned from his trip to Okinawa, Japan. He was kind enough to share some of his pictures and experiences with us! This is How We Travel. I recently had the fortune to travel to Okinawa. Despite having lived for several years on Japan's mainland, this was my first visit to Okinawa and in every way it exceeded my expectations. I flew into Tokyo and connected directly to Naha, Okinawa's largest city on Okinawa Honto, Okinawa's main island ("honto" just means "main island"). If I had to do it again, I would spend 1-2 nights in Tokyo at the start, because by the time I arrived in Okinawa I was exhausted (and a ramen in Tokyo would have been a nice treat after the 10-hour flight). On the flip side, I was thrilled to wake up the next morning already in paradise... so for shorter trips, flying into Okinawa directly makes perfect sense. Okinawa has a warm climate, with mild winters, warm spring and fall, and very hot summer. 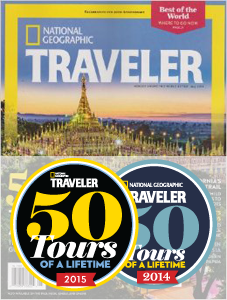 It is a year-round destination, though most people avoid it during the rainy season. During my trip in March, the weather was ideal: warm days and breezy nights. Most people start on the main island, Okinawa Honto. Naha is the major city here, on the southern end of the island. Some people head straight for the northern beaches of the main island, in the Nago and Onna-son areas. The northern end of the main island is full of beach resorts; while Naha is a bustling city full of history, culture, markets, and nightlife. (The military bases are primarily in the center of the main island, and thus quite a bit away from either north or south). 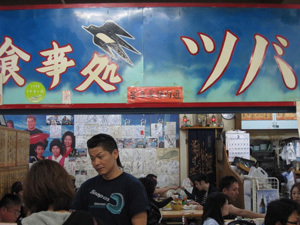 Naha itself is not a beach destination, but is the perfect stop before or after visiting the beaches. It has great food, music, history and shopping. 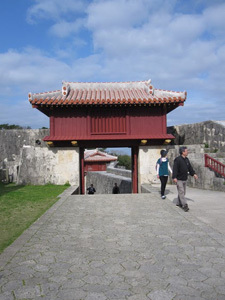 The main "must-see" here is Shuri-jo, or Shuri Castle. 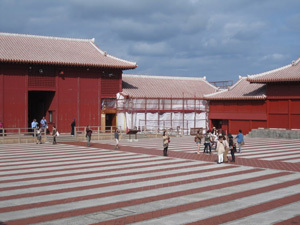 A UNESCO World Heritage Site, Shuri-jo was the palace of the native Ryukyu Kingdom. The Ryukyu ruled Okinawa for several centuries until ultimately ceding control of Okinawa to the Japanese in the late 19th century. Ryukyu culture is a unique culture, distinct from Japanese and Chinese cultures, yet with elements similar to both. The Okinawan archipelago lies right in between Taiwan/China and Japan, and was thus an important location in between the mainland and Japan for centuries. I was taken aback by how alive Ryukyu culture remains in Okinawa to this day, despite the fact that Okinawa is also firmly a part of Japan (in some ways comparable to the somewhat complicated coexistence of Hawaiian and American culture in Hawaii). Shuri-jo is a reconstruction, as it was destroyed during WWII (not the first time it had been leveled in its history). It's a beautiful, sprawling complex with panoramic views over Naha and out to the ocean beyond. From Shuri-jo I headed back into central Naha for lunch at Naha's central market, the Makishi Public Market. 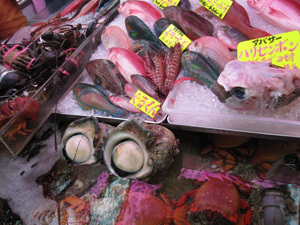 The first floor of this lively and pleasant market is full of fresh seafood, butchers hawking pork (a staple of Okinawan cuisine), and other local specialties. 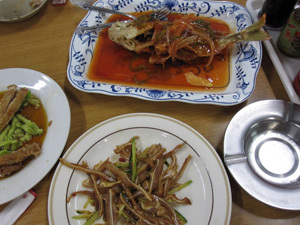 You can buy a fish downstairs and have it cooked upstairs, or simply go to the second floor where a dozen or so cafeteria-style diners compete for your business. The food is delicious, hearty working-class fare that is best accompanied by a beer... or several, if you're an old local. At 11:30 am there were already several happily drunk old men sitting on tatami near my table. The food was great, and cheap. From its central location, walking off the relatively heavy food is easy as several interesting walking streets surround the market. 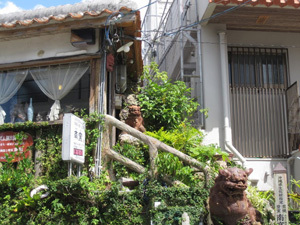 One of the most charming is the quiet Tsuboya Pottery Street, just around the corner. Okinawan pottery is renowned and the most common item to purchase, in some form or another, are the ubiquitous shisa, a protective figure that is a cross between a lion and a dog. Having explored Naha city, I called it a day!